Bandula Warnapura had the honour of leading Sri Lanka when they finally became a fully-fledged Test-playing country. 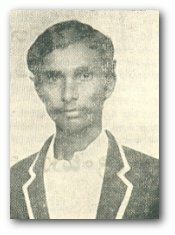 An opening batsman with a solid technique, Warnapura was also a capable medium-pace bowler. He failed to make an impression with the bat in his four Tests, achieving his highest score of 38 in Sri Lanka's inaugural Test. His bowling was more effective in the one-day format where he had the ability to maintain a steady line and capture the occasional wicket. Arjuna Ranatunga is a stockily-built left-handed batsman who led Sri Lanka to their greatest cricketing triumph, the 1996 World Cup. His innovative captaincy took a Sri Lanka team given little chance prior to the competition for cricket's greatest prize. He made his debut in Sri Lanka's inaugural Test at the age of 18, and made his country's first Test half-century. A dominant figure on cricket fields all over the world for nearly 20 years, he never shied from confrontation, defending his players and rights to the hilt. A schoolboy prodigy Anura Ranasinghe made his international debut in the 1975 World Cup against the might of the West Indies whilst still only 18 years of age. 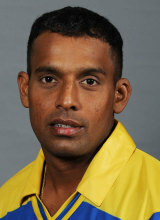 Ranasinghe played in all three matches for the Sri Lankans without producing any performance of note. His test debut came on Sri Lanka's inaugural Test tour of Pakistan in the second Test at Faisalabad. Sidath Wettimuny was a fixture at the top of the order following Sri Lanka's inauguration into the Test arena. Wettimuny was a solid right-hand batsman with a compact technique. Wettimuny was the younger of two brothers to play for Sri Lanka; in fact in a rare instance he opened the batting with his brother, Mithra, in two Test matches. Wettimuny made two centuries at test level both of them having historical significance. Lalith Kaluperuma was an accomplished off spinner at domestic level when Sri Lanka was granted Test status. Also capable in the lower order with the bat, he failed to transfer his domestic form to the international arena. Playing in Sri Lanka's inaugural Test against England, one of three spinners, he was used sparingly as the two de Silvas, D.S. and Ajith, shared the brunt of the workload. Making the proceeding tour to Pakistan he was selected for the second Test at Faisalabad, again he was overshadowed by the de Silva's bowling only 6 overs in the match. He ended any chances of further representative honors choosing to join the tour of to South Africa in 1982/83. He later became a national selector and headed the selection panel in May 2005, taking over from Ashantha de Mel. Ajith de Silva was a highly rated left arm orthodox spinner within his homeland. It was a great disappointment to his supporters when he failed to make a significant impact at the highest level. De Silva was selected in the inaugural test team that played England at Colombo. He had a steady, though somewhat disappointing debut taking two wickets in each innings, bowling with admirable accuracy but failing to give the ball sufficient flight on what was a favorable wicket for spin bowling. It was expected that along with D.S. de Silva, he would form a spin combination that would hold Sri Lanka in good stead during its formative years in test cricket. However, this was not the case, his returns in three other tests were below expectations. On the tour to Pakistan he bowled accurately at Karachi and Faisalabad but struggled to dismiss test quality batsman. He ended any further chance of representing Sri Lanka when in 1982/83 he joined the tour to South Africa. Greatness was firmly thrust upon Sri Lankan wicketkeeper-opener Brendon Kuruppu, but only for a day or two, as he became only the third person to score a double-century on his Test debut, against New Zealand - Richard Hadlee and all - in Colombo. Kuruppu did it the hard way too: his 777-minute innings is the slowest double-hundred in first-class history, all very out of character for a man who later made his reputation as a one-day slogger. It was his first first-class century, and his last Test century: Kuruppu only played four Tests, two of them in England, in 1988 and 1991. A dashing right-hand batsman and brilliant fielder Roshan Mahanama's is best remembered as a cricketer for his world record second wicket partnership of 576 with Sanath Jayasuriya in a Test match against India at the R Premadasa Stadium in 1997, since surpassed by Kumar Sangakkara and Mahela Jayawardene in 2006. Mahanama's contribution to that partnership was 225, the highest score of his career. He was a key member of Sri Lanka's World Cup winning side of 1996. Following his team's disastrous showing in the 19	99 World Cup, Mahanama was dropped from the side to groom young talent. A right-hand batsman and medium fast bowler Nishantha Ranatunga, has played one day matches against Zimbabwe and Pakistan in 1993. Nishantha represented Sri Lanka school team in Australia in 1984 during his schooldays.He has played for SSC nine years and Five years in Colts Club as Captain. A technically accomplished No. 3, Asanga Gurusinha was the rock on which the Sri Lankan batting was founded for 11 years.His gutsy lone battles earned the respect of opponents around the world: a Sri Lankan total of 82 in Chandigarh in 1990-91 contained an unbeaten Gurusinha half-century; at Melbourne in 1995-96, he scored 143 to his team-mates' 144; and with Aravinda de Silva's help, he turned the tables on Australia in the 1996 World Cup final with another half-century. An opening batsman with a compact style and steadfast nature, Hathurusingha forged a steady opening partnership with Roshan Mahanama. Capable of playing lengthy innings when the situation warranted ,Hathurusingha possessed a variety of strokes. A handy medium-pace bowler, capable of genuine movement through the air. Called into the side against New Zealand at Hamilton as a replacement for the injured Mahanama, he responded by making three half-centuries in his first three Tests. He quit first-class cricket in 2005 to focus on coaching and has since coached UAE and Sri Lanka A. A right hand top-order batsman and handy off-spin bowler Kaluperuma struggled to adjust in his brief opportunity at international level. Blooded during a period in which Sri Lanka was searching for players with the ability and determination to succeed at the highest level, Kaluperuma's form for the under 23 side brought him to the attention of the selectors. Making his debut against New Zealand batting at number three he failed to make an impression with the bat although he did capture 2/17 with his off-spinners. A vulnerable starter, Atapattu showed immense strength of character once he got his eye in. On a lifeless pitch, he was a master of the percentage game, his caution a useful counterpoint to the risks taken by Sanath Jayasuriya, his opening partner almost throughout his Test career. All his big Test innings - he scored six double-hundreds in his career, a feat bettered only by Don Bradman (12), Wally Hammond and Brian Lara (seven each) - were been slow affairs but the most tortuous episode of his international career was its start: it took him nearly seven years to get established. Dharmasena came into the international scene in 1994 against South Africa, aged 22. His quickish off spinners, delivered with a slightly unorthodox action, are invariably accurate making him an ideal one-day bowler, especially in Sri Lankan conditions. With time he has also developed into a useful middle order batsman, which has guaranteed him regular place in the Sri Lankan one-day squad. His career came to a standstill after the Oval Test in 1998, when the ICC questioned his bowling action. An explosive left-hand opener in the mould of Sanath Jayasuriya, Gunawardene lives on the wild side. He first made headlines at the Commonwealth Games in 1998, scoring a century and top-scoring in the semi-final defeat to South Africa. A few months later, deputising for Jayasuriya, he smashed 145 off 20 overs with Kaluwitharana in an audacious attempt to reach 311 against Australia at Melbourne. He scored a career-best 132 against West Indies in the ICC Knockout in 2000. A fine technician with an excellent temperament,Jayawardene's exciting arrival in 1997 heralded the start of a new era for Sri Lanka's middle order. His career reached new heights in 2006 when he was named captain, led a 5-0 one-day whitewash over England and then scored a Sri Lankan record 374 against South Africa at the SSC in Colombo. He added 624 for the third wicket with Kumar Sangakkara - a first-class record. As an offspinner, Thilan Samaraweera lived in the shadow of Muttiah Muralitharan during the early days, only sporadically playing in one-day matches. But since scoring a Test century on debut against India in August 2001, an innings that helped Sri Lanka to a 2-1 series win, he has carved out a reputation as a specialist Test batsman. However, he will also be remembered as a player who took a bullet during the Lahore terror attack on the Sri Lanka team bus early in 2009. Shantha Kalavitigoda was a surprise call-up for Sri Lanka's postponed tour to New Zealand in 2004-05. But Kalavitigoda, a right-handed opener, has been quietly knocking on the door in recent years. In 2003-04 he was adjudged the best batsman in the Premier League, and in 2004-05 he scored nearly 800 runs for Colombo Colts and North West Province. That was enough to win him selection to the A team against England A in March 2005. Kalavitigoda's first taste of international cricket was with the Sri Lankan under-17 team at the 1994 World Cup in Malaysia. He was a prolific scorer for his school, Nalanda College, and once shared a 380-run partnership with Mahela Jayawardene in an under-23 match for SSC, his first club. 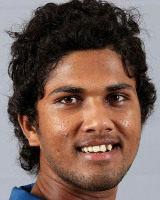 Dinesh Chandimal is unarguably the most promising young batsman going around in Sri Lankan cricket. A technically sound batsman with strokes all around the wicket, Chandimal also stands out because of the maturity he shows at the crease and his temperament to build and pace an innings. He made his international debut when only 21, and impressed almost immediately, scoring 111 in his second ODI, against India in the 2010 triangular series in Zimbabwe. Four innings later, he made another century, this time against England at Lord's, but his stocks rose significantly in 2012, when he performed superbly in ODIs on successive tours to South Africa and Australia.